Your monetary donations and donations of clothing and household goods that are in good condition or better are entitled to a tax deduction, according to Federal law. 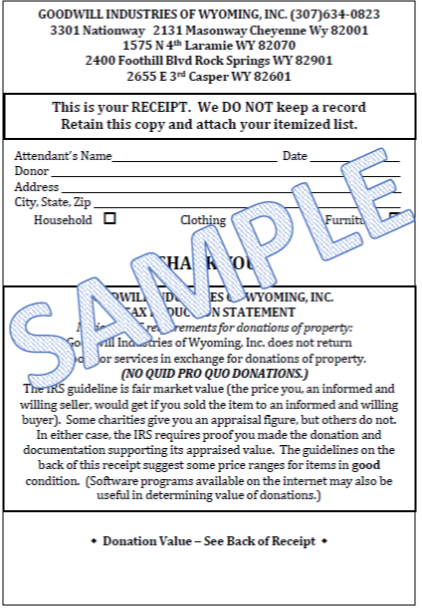 Goodwill Industries of Wyoming is a 501(c)(3) non-profit organization. When you donate online, you will be emailed a receipt for your tax records. When you donate directly to us, we will provide a receipt to you as well. When dropping off donations at any of our stores, be sure to get your donation receipt so you can complete for your next tax season. You can rest assured that your goods will be transformed into life-changing programs and resources for the most vulnerable individuals in Wyoming.